If you are contacted by investigators at the Medicaid Fraud Control Unit, the Office of Medicaid Inspector General (OMIG), or the HRA Bureau of Investigation, you need to speak with an experienced Medicaid fraud defense lawyer immediately. Medicaid auditors and investigators do not conduct random audits or interviews. By contacting you, they are signaling that you are the target of a Medicaid fraud investigation. You are at risk of facing serious criminal charges. You should not try to handle this on your own. How do you find the best Medicaid fraud defense lawyer to protect your rights? Focus on three qualifications. There is no such thing as a "routine" Medicaid audit or investigation. By the time you are contacted by investigators or receive a subpoena, the investigators have completed most of their investigation. They already believe that you have committed Medicaid fraud. Now they are trying to gather evidence to prove their case beyond a reasonable doubt. Medicaid fraud audits and investigations are like cancers. Your chances of success are much greater if you detect and treat the problem at its earliest stages, before any criminal charges are filed. Waiting until you are formally charged with a crime before hiring a criminal defense attorney makes about as much sense as delaying a visit to the oncologist until you have reached stage four cancer. Many good criminal defense lawyers are generalists. They use their trial skills and knowledge of criminal procedure to defend clients accused of all sorts of crimes, from assault to securities fraud to drunk driving to possession of narcotics. You need a specialist. Your lawyer needs to combine criminal defense experience with an in-depth understanding of complex Medicaid rules and regulations that are constantly changing. In addition, your lawyer must have a background in healthcare, including the ability to read and understand patient charts. Medicaid fraud is investigated and prosecuted by a number of different government agencies. In New York, these include the Attorney General's Medicaid Fraud Control Unit, the Department of Health's Office of the Medicaid Inspector General (OMIG), and the Human Resources Administration's Bureau of Fraud Investigation. Each of these agencies has its own policies and procedures for conducting an investigation, negotiating a resolution, and deciding whether or not criminal charges should be filed. How you approach a Medicaid fraud audit or investigation will depend on which agency is involved. Your lawyer should have experience with the specific agency involved in your case. You can schedule a consultation with an experienced Medicaid fraud defense attorney by calling John Howley, Esq. at (212) 601-2728. Mr. Howley has more than 25 years of experience representing pharmaceutical and biotech companies, hospitals, physician practice groups, individual healthcare professionals, and Medicaid beneficiaries. He has received the Gideon Champion of Justice Award from the New York State Association of Criminal Defense Lawyers, the Medal for Excellence in Advocacy from the American College of Trial Lawyers, and the Thurgood Marshall Award from the New York City Bar Association. ​Your first warning of a Medicaid fraud investigation comes when you receive a letter asking you to bring your tax returns to an “interview.” The letter usually comes from the Human Resource Administration, the Department of Social Services, or the HRA’s Investigation Revenue and Enforcement Administration, Bureau of Fraud Investigation. You must not ignore this letter. You are the target of a Medicaid fraud investigation. You must take steps to protect your rights. By the time you receive the target letter, an investigation is already well under way. The investigators have already compared your Medicaid application and re-certifications with your payroll records, credit reports, bank balances, and other records. They have been to your home, watched who went in and out, taken pictures for their investigation file, and spoken with your employer. They know how much you earn, where you live, who lives with you, and whether the people who live with you have an income that was not reported on your application and recertifications. Anything you say to the investigators will be used to build the case against you. You should speak with a lawyer before you speak with the investigators. The best Medicaid fraud defense lawyers will take the time to understand your situation, review your financial records, and talk to the investigators before you say anything. In most cases, you will never have to appear for an interview or answer any questions. Your lawyer can negotiate with the investigators on your behalf. Even if you made mistakes and have to pay back benefits, your lawyer can negotiate with the investigators to reduce the amount you owe and spread any payments out over time. Do not walk into a trap. Consult a with an experienced Medicaid fraud defense lawyer before you say anything to the investigators. John Howley, Esq. has represented hundreds of people just like you before the Bureau of Fraud Investigation. Call him directly at (212) 601-2728 to schedule a consultation. The HRA Bureau of Fraud Investigation sends out thousands of letters every year asking people to come in for an “interview” with Medicaid fraud investigators. The “interviews” are conducted at three locations: 250 Livingston Street in Brooklyn, 151 West Broadway in Manhattan, and 250 Church Street in Manhattan. If you received a letter asking you to come in for an “interview,” it means that you are the target of a Medicaid fraud investigation. What you do next will have serious consequences. Why do Medicaid fraud investigators want to “interview” me? What do the Medicaid fraud investigators know about me? You would be surprised and maybe even shocked to find out how much the Medicaid fraud investigators already know about you. Using sophisticated data matches and data analytics, the Bureau of Fraud Investigation has matched you and everyone who lives with you against credit reports, car registration records, car loans, property and mortgage records, marriage and birth records, employment records, bank records, and other government databases. By the time the investigators contact you, they have already obtained payroll records from your employer, they have been to your home to see who lives there, they have taken pictures of your home and the people who live with you, and they have spoken with your neighbors and employer. The “interview” with Medicaid fraud investigators is not the beginning of the investigation. It is the beginning of the end of the investigation. Anything you say during the “interview” can and will be used against you. What will happen if I refuse to meet with the Medicaid fraud investigators? If you fail to show up for the “interview,” the HRA may close your case and stop your benefits. The Bureau of Fraud Investigation will also send your case to the lawyers for legal action. The investigators may refer your case to the District Attorney for criminal prosecution. The usual charges are Welfare Fraud and Grand Larceny, which are felonies. The government’s lawyers may also file a civil lawsuit to force you to pay back tens of thousands of dollars in Medicaid benefits. What will happen if my case is referred to the District Attorney? If your case is referred to the District Attorney, then you will be arrested, handcuffed, fingerprinted, and held in a jail cell while detectives run a “rap sheet” to find out if you have any prior convictions. Then you will be brought before a judge for an arraignment on serious criminal charges. The judge will decide whether to make you post bail or release you on your own recognizance. The best way to protect yourself in a Medicaid fraud investigation is to consult with an experienced Medicaid fraud lawyer immediately. Talk to a lawyer before you speak with the investigators. ​Your lawyer will review your tax returns and other financial records. He will talk with you about your particular circumstances. He will identify the problem areas and help you develop explanations or defenses. Most importantly, your lawyer can meet with the investigators to find out why they are looking at you, what they already know, and whether they are willing to negotiate a settlement that will avoid any civil lawsuits or criminal charges. In most cases, our clients never have to meet with the investigators or answer any questions. We can negotiate with the investigators for you. You need to deal with the investigator’s letter right away. Start with a free and confidential consultation with a Medicaid fraud defense lawyer. We will review your situation and help you understand your options. If you choose to retain us, our fees are reasonable and we offer payment plans. Do not delay. Do not wait for detectives to show up at your door to arrest you. Call our office today at (212) 601-2728 to speak with an experienced Medicaid fraud defense lawyer. Do I Need a Lawyer for an Interview at the NYC Bureau of Fraud Investigation? You should consult with an experienced Medicaid fraud lawyer immediately. While many cases at the Bureau of Fraud Investigation are resolved without criminal charges, one wrong step could result in you being arrested for Medicaid fraud. It is critical that you contact a lawyer before you speak with the investigator. The so-called “interview” is actually an interrogation by two experienced fraud investigators. They will make copies of any tax returns or financial records you give them. They will ask you detailed questions about your family and finances. Anything you say can and will be used against you if they have you arrested. Most people do not realize that you are not required to speak to Medicaid fraud investigators. You have a right to be represented by a lawyer. Your lawyer can speak with the investigators, find out what their concerns are, and negotiate with the investigators. In most cases, you will never have to meet with the investigators or answer their questions. Even if you provided false or incomplete information on your Medicaid application or re-certification, an experienced Medicaid fraud lawyer can often negotiate a repayment agreement (usually for less than the full amount owed) that avoids any criminal charges. That said, you should never ignore the investigators. You should get a lawyer to contact them on your behalf. Ignoring the investigators will only make matters worse. John Howley, Esq. has more than 27 years of experience representing clients in serious fraud cases. He represents clients every week at the Bureau of Fraud Investigation offices at 151 West Broadway and 250 Church Street. Call him today at (212) 601-2728 to schedule a free and confidential consultation. Every year Medicaid fraud investigators refer hundreds of cases to the District Attorney’s office for criminal prosecution. You will first learn about the criminal charges when a NYC police detective calls and asks you to “surrender.” The detective will not tell you much about the charges. He or she will simply give you a choice of one or two dates to surrender yourself. This is the start of a process that could result in you spending time in jail. You should contact an experienced Medicaid fraud lawyer immediately to protect your rights. If you surrender to the detective on your own, you will be arrested and processed. You will be fingerprinted and your “mug shot” will be taken. Your information will be sent to Albany to determine if you have any prior arrests or convictions. This can take 24 hours or longer. In the meantime, you will either be handcuffed or sitting in an uncomfortable jail cell with other people who have been arrested for all sorts of crimes. Then you will be brought before a judge in the same clothes you slept in for an arraignment to decide on bail. Contacting a lawyer before you surrender can make a big difference. Your lawyer can talk to the detective and an Assistant District Attorney to learn the details of the Medicaid fraud charges against you. In some cases, your lawyer may be able to avoid an arrest. In most cases, your lawyer can avoid a night in jail by working with the detective to expedite the process. Armed with information from you, the detective, and the Assistant District Attorney, your lawyer will represent you at the arraignment and argue that you should be released on your own recognizance. In other words, your lawyer will argue that you should be released without posting any bail. At the arraignment, your lawyer will be given an affidavit describing the evidence against you and the criminal charges. The most common Medicaid fraud charges are Grand Larceny, Welfare Fraud, and Offering a False Instrument for Filing. Each of these crimes is a felony that carries the potential for a prison sentence, restitution (paying back tens of thousands of dollars in benefits), fines and court costs, probation, and a criminal record. You and your lawyer will go over the evidence and the charges together. You will discuss your response and any evidence you may have to support your side of the case. Your lawyer will advise you on possible defenses and a strategy for opposing the charges. Once you and your lawyer understand all the facts and circumstances, your lawyer will begin negotiations with the Assistant District Attorney. If you have evidence that contradicts the evidence in the affidavit, your lawyer will present that evidence to the Assistant District Attorney in an effort to get them to drop the charges. Even if the evidence against you is strong, your lawyer will negotiate a reduction of the charges in return for paying back some or all of the benefits they claim you should not have received. Your lawyer may also negotiate a proffer agreement. This is an agreement that allows you to present your case directly to the Assistant District Attorney with a promise that nothing you say can be used against you. If necessary, an experienced Medicaid fraud attorney can also arrange a proffer with the Chief of the District Attorney’s Welfare Fraud Unit. In most cases, criminal charges can be reduced, even if you are guilty, by agreeing to make restitution. In some cases, the District Attorney can be convinced to drop the charges altogether. In other cases, the charges may be reduced to a misdemeanor, or even a violation which does not result in a criminal record. What happens in your case will depend on the specific facts, how much restitution they demand, and – most importantly –how you respond to the detective on day one. If you have been told that your Medicaid fraud case is being referred for criminal prosecution, or if you have been contacted by a detective with the District Attorney’s office, you should contact an experienced Medicaid fraud defense lawyer immediately. John Howley, Esq. has more than 27 years of experience representing clients in government investigations and criminal prosecutions. He regularly represents clients before the District Attorneys’ offices, the U.S. Attorneys’ offices, the New York State Attorney General’s Office and Medicaid Fraud Control Unit, and the NYC Bureau of Fraud Investigation. Call him directly at (212) 601-2728 to schedule a consultation. If you received a letter from the NYC Bureau of Fraud Investigation, then you are the target of a Medicaid fraud investigation. The investigator already has evidence suggesting that you were not eligible for Medicaid benefits. They are not contacting you to help you. They are contacting you to determine whether to refer your case to the District Attorney for criminal prosecution. Here is the good news. The investigator has not yet made a final decision in your case. You still have a chance to avoid criminal charges. In fact, many cases are resolved with no criminal charges. How you respond to the investigator is critical. Your first step should be to consult with an experienced Medicaid fraud lawyer. Your lawyer can help you figure out why you are being investigated, what defenses you have, and how to respond to the investigator. ​This is not a complete list. An experienced Medicaid fraud lawyer will go over your situation in detail to understand why the investigator is targeting you and how to build your defenses. You lawyer can also talk directly to the investigators. The Bureau of Fraud Investigation letter will ask you to come in for an “interview” and to bring along your financial records such as tax returns, bank statements, and pay stubs. If you go in for the “interview” alone, you will be placed in a small, windowless room with two investigators – the type of room you see the police use for interrogations on television. The two investigators will copy all of your records. Then they will close the door and ask you detailed questions about your employment, income, work, family, and household expenses. You do not have to go through this alone. In fact, if you retain a Medicaid fraud lawyer to represent you, then you may not have to answer any of the investigator’s questions at all. Your attorney will contact the investigator for you. He will meet with the investigators and go over their concerns. Your attorney will help you to decide whether to cooperate with the investigators and negotiate a settlement, or whether to assert your right to remain silent. In many cases, an experienced Medicaid fraud attorney can negotiate a financial settlement with the investigators that avoids any criminal charges, even if you lied on your Medicaid application or re-certifications. ​​John Howley, Esq. has successfully represented clients in hundreds of Medicaid fraud investigations and has more than 27 years of experience. To schedule a free and confidential consultation with Mr. Howley, call him today at (212) 601-2728. The Medicaid Fraud Control Unit is part of the New York State Attorney General’s office. It is charged with identifying, investigating, and prosecuting Medicaid fraud by physicians, nurses, dentists, pharmacists, physical therapists, durable medical equipment suppliers, hospitals, nursing homes, and other healthcare providers. Medicaid fraud is the largest unit inside the Attorney General’s office, and it is staffed with some of the most experienced lawyers, auditors, and investigators. Every year, the unit recovers hundreds of millions of dollars from healthcare providers in the form of restitution and fines. It also receives 3 to 1 matching funds from the federal government. As a result of the money available, the unit is constantly adding more prosecutors, auditors, and investigators. The Medicaid Fraud Control Unit is very aggressive. It does not focus only on so-called “Medicaid mills,” where organized criminals set up sham entities for the sole purpose of billing Medicaid. The unit also targets legitimate healthcare professionals. In fact, the Medicaid Fraud Control Unit frequently targets physicians, pharmacists, and other healthcare professionals who run legitimate practices. Many of the unit’s prosecutions are for using the wrong billing codes, failing to maintain adequate records, or having business relationships that violate the anti-kickback and physician self-referral laws. What may seem like a technical violation can result in felony charges and a prison sentence. Even if you avoid a criminal conviction, your career can be ended by the loss of professional licenses or exclusion from the Medicaid and Medicare programs. Responding to a Medicaid Fraud Control Unit investigation requires highly specialized legal advice. It is not enough to retain a capable criminal defense lawyer. You need a lawyer who understands the constantly changing Medicaid rules, and who understands how the Medicaid Fraud Control Unit conducts investigations and makes decisions. Early intervention is your best chance of avoiding a criminal prosecution or reducing the charges. If you are innocent, the investigation stage is your last chance to convince the investigators before criminal charges are filed against you. If you made mistakes, the investigation stage is your last chance to negotiate a financial settlement or favorable plea agreement. Most Medicaid fraud cases are won (or lost) at the investigation stage, before the prosecutors have decided to file any criminal charges. By working with Medicaid Fraud Control Unit investigators early in the process, your lawyer can help you develop a strategy to respond to their concerns. It is, therefore, critical to retain an experienced Medicaid fraud defense lawyer as soon as you have any indication that you are under investigation. The criminal penalties for Medicaid fraud are severe. The penalties include restitution and fines, loss of professional licenses, and exclusion from the Medicaid program. If you are convicted of a misdemeanor, you can be sentenced to up to one year in jail. If you are convicted of a felony, the most serious cases can result in a sentence of up to 25 years in prison. And if you are not a U.S. citizen, you may be deported. The answer depends on how you respond to the investigators, how strong the evidence is against you, whether you have been convicted of a crime in the past, and a number of other factors. You need to sit down with an experienced Medicaid fraud defense lawyer immediately to assess your case and develop a strategy. Medicaid fraud cases generally fall into two categories. Some cases can be defended. The evidence may be weak or ambiguous, and you may have legitimate explanations for what happened. If the evidence against you is weak and you have strong defenses, your lawyer should make every effort to challenge the government. With thorough preparation, and by engaging with investigators early in the process, your lawyer may be able to convince them to drop the case completely or to resolve it with a monetary settlement. In other cases, the evidence against you may be strong and you may have no real defense. Even in those cases, an experienced Medicaid fraud lawyer can take action to minimize or reduce the criminal charges. Some cases that begin with felony charges and the possibility of a prison sentence can be resolved with a misdemeanor plea and no jail time. In some cases, we have been able to negotiate plea agreements that avoid criminal charges and a criminal record altogether. The key is getting an experienced Medicaid fraud lawyer involved at the earliest possible moment. Medicaid fraud prosecutions are like a cancer. Early intervention is critical to a successful outcome. What is the NYC Bureau of Fraud Investigation? The Bureau of Fraud Investigation is part of the NYC Human Resources Administration. It is responsible for investigating Medicaid fraud. It has two primary offices at 151 West Broadway and 250 Church Street in Manhattan. The bureau is staffed with experienced Medicaid fraud investigators. Many of the investigators have degrees in criminal justice, accounting, and related fields. They are trained in investigative techniques, including how to interrogate fraud suspects. They conduct more than 5,000 investigations every year. The letter is called a “target letter” because it means that you are the target of a Medicaid fraud investigation. The investigators already believe that you have committed fraud. They are not asking for an interview so they can help you. They have built a case against you, and now they want to confront you with their findings. If you go to the interview alone, they will try to get you to admit that you are guilty of Medicaid fraud. If you refuse, they will cross-examine you with all of the information they have gathered over the past weeks and months. Long before you ever heard of the Bureau of Fraud Investigation, the investigators were busy building a case against you. They already have your Medicaid applications and re-certifications. They have payroll records from your current and former employers, some of your banking information, credit reports, car registrations and driver’s license, and deeds and mortgage documents if you own any real estate. They also have payroll records and other financial documents for everyone who lives with you. Before the “interview,” the investigators already conducted site visits to your home. They may have taken pictures of your home, looked inside your windows, and interviewed your neighbors. If the investigators determine that you committed Medicaid fraud, they will decide what to do next. The most serious cases will be referred to the District Attorney for criminal prosecution that can result in a criminal record, heavy fines, and even a prison sentence. Other cases will be referred to the City’s lawyers, who will sue you for tens of thousands of dollars. Some cases will be settled either by convincing the investigators that you did nothing wrong, or by agreeing to pay back some of the benefits you received. What will happen in your case? That depends on how you respond to the investigators. An experienced Medicaid fraud lawyer can help by reviewing your financial documents before anyone talks to the investigators. Your lawyer can identify problems and help you develop a strategy designed to (a) avoid criminal charges, (b) reduce any demands that you pay back benefits, and (c) eliminate any claims for penalties or interest. To schedule a free and confidential consultation with an experienced Medicaid fraud lawyer, call The Howley Law Firm today at (212) 601-2728. Why Am I Being Investigated for Medicaid Application Fraud? When clients receive a letter from the Bureau of Fraud Investigation, one of the first questions they ask is: Why did the investigators decide to investigate me? You are being investigated because the information you provided on your application does not match up with what the investigators see in other records. Sometimes the other records suggest that you earn more money than you disclosed. Other times, the problem is confusion over where you live or who lives with you. Someone blew the whistle and accused you of Medicaid fraud. By the time you receive a letter from Medicaid fraud investigators, they have already completed most of their investigation. They have reviewed all of your applications and re-certifications for Medicaid benefits. They have compared the information you provided with property records, credit reports, car registration records, school records, and anything else that discloses where you live, where you work, and what you own. They have obtained your payroll records from your current and former employers. The Bureau of Fraud Investigation letter asks you to come in for an “interview” with fraud investigators. The “interview” is actually an interrogation. Two investigators will put you in a small room with no windows. One will ask you questions and about every aspect of your family and financial life. The other investigator will write down everything you say that helps them build a case against you. If the investigators believe that you committed a crime, then they will refer your case to the District Attorney for criminal charges. You could face grand larceny and other felony charges that carry a possible sentence of up to five years in prison. Or the investigators may refer your case to the City’s lawyers, who may sue you for tens of thousands of dollars in benefits, plus interest and court costs. In either event, anything you say to the investigators may be used against you in a court of law. You need to get an experienced Medicaid fraud defense lawyer on your side. Your lawyer will review your documents before anything is said or turned over to the investigators. Your lawyer will meet with the investigators, discuss the issues, and in many cases negotiate a resolution that avoids any criminal charges or expensive lawsuits. In most cases, you can avoid the interview and interrogation by having your lawyer talk to the investigators instead. If the investigators want you to pay back benefits, an experienced lawyer can often negotiate a reduction of their demand, the elimination of any penalties or interest, and a manageable payment plan with monthly installments. To schedule a free and confidential consultation with an experienced Medicaid fraud defense lawyer, call The Howley Law Firm at (212) 601-2728 today. 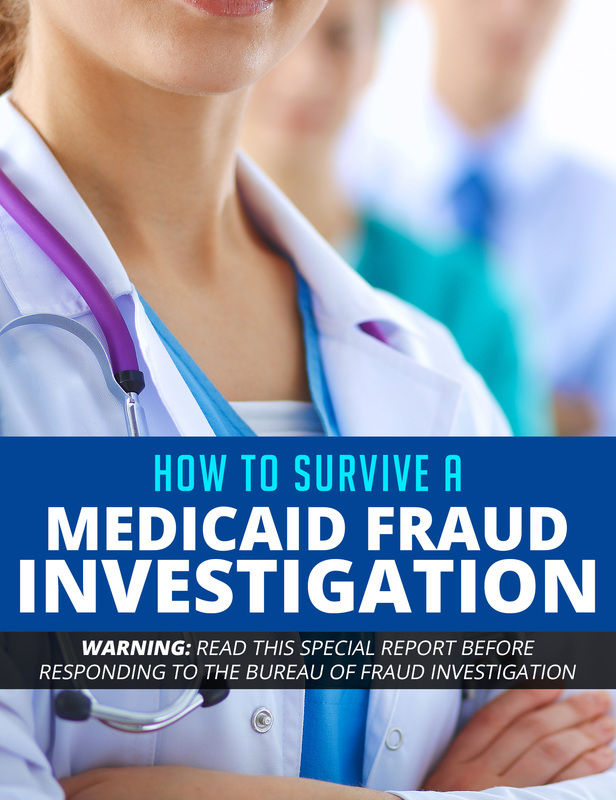 Medicaid fraud cases are often won (or lost) at the investigation stage, Before you talk to investigators, educate yourself by downloading a free copy of our special report.